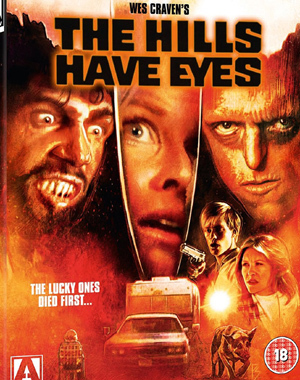 "The Hills Have Eyes "
L’image : Remarquable vu qu’a la base le film fut tourné en 16mm. Le son : Un "tour de force" sachant les limitations de l’enregistrement d’origine et son résultat 40 ans plus tard. Looking Back on The Hills Have Eyes (1080i ; 54:35) is a well done retrospective featuring interviews with Wes Craven, Peter Locke, Michael Berryman, Janus Blythe, Robert Houston, Susan Lanier, Dee Wallace and Eric Saarinen. Family Business (1080p ; 16:08) is an interview with Martin Speer. The Desert Sessions (1080p ; 11:00) is an interview with composer Don Peake. Alternate Ending (1080p ; 11:34) is also available via seamless branching under the Play menu if you want to watch the film that way.